If you a looking for an automatic tea maker, the Breville One-Touch is a great option. 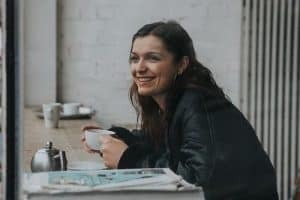 As a tea drinker I love making a pot of tea to sit down and relax with; this daily experience could only be made better by the addition of a Breville One-Touch Tea Maker to my kitchen appliance stash. A glass teapot is a very stylish accessory for your kitchen, and with an auto start and a 60 minute keep warm feature, it is easy to enjoy a hot tea at your leisure. Making tea to your taste takes precision – the temperature of the water, the amount of tea leaves you use, and how long you brew your tea for and so on. 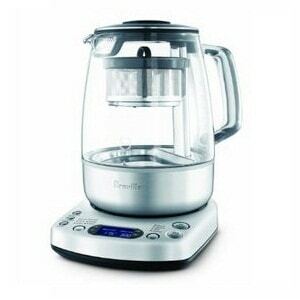 The Breville One-Touch takes away the fuss and makes your tea how you like it at the temperature required. The one thing I really dislike about sitting down to a pot of tea in my old cast iron teapot is that the leaves don’t really swirl around the pot. Sure I could sit there and swirl a pot of tea, but it’s probably not a great idea with boiling hot water. The Breville One-Touch has a tea basket cycle which automatically lowers and lifts the tea basket in and out of the water giving you a much better brew. A glass teapot is a great option if you love watching the leaves unfurl (for those who drink herbal teas you know just how interesting it can be watching flowers and herbs unfurl in the hot water); it is also very robust and unlikely to break from heat. Glass is also non-porous so you shouldn’t get any aftertaste that may be left behind from the previous tea brewed in this pot; a real bonus compared to teapots made of pours materials such as ceramics or clay. Another great thing about this tea maker comprising of a see-through glass pot is that if you are making tea for more than just yourself, everyone can see the color of the tea and can easily determine the intensity or desired taste of their brew. I like my tea dark and strong but many of my guests prefer it weaker, so the Breville One Touch is perfect for when guests come around. Even if you are a picky tea drinker, and don’t think a machine could make your tea the way you want, give this product a go. If you are looking for an automatic tea maker, and you have a decent budget to play with, the Breville One-Touch is certainly an option I would be looking into.